Over the past month or so, we’ve incurred some larger expenses related to unexpected car repairs and other miscellaneous things. But, I really wasn’t overly concerned and managed to keep my peace through it all. None of these expenses caused us to stress over being able to pay the bills or caused us great worry. The reason we were able to keep things status quo through it all wasn’t anything magical. We just had savings to back us up. While my wife and I try not to place all our hope in money – there is something to having some on hand that provides more peace of mind. And, I’m all for creating more peace in our life. There’s enough strife and stress around us as it is. All this got me to thinking about other financial moves that we all can do to add more peace in our lives. I used to live paycheck-to-paycheck where I was just fretting about whether or not I’d be able to pay this bill or that bill. And, it’s no fun. Here’s to more peace of mind for all! One of the first things I did when I was getting out of debt (more than 10 years ago) was to get life insurance. One thing I feel pretty strongly about is taking care of my messes. I knew that if I passed away while paying off some of my debts, it would likely all be forgiven. But I wanted to be able to cover these responsibilities regardless. I also was single at the time and my mother was widowed. I wanted to leave her with a little extra. Having life insurance – especially if you are with family – is a no-brainer. Get it. Whenever I hear about young people / families wanting to buy a house, I offer them my two cents (whether they like it or not). If you are married, purchase something that one spouse can adequately cover with their salary. This is pretty abnormal today – where most young folks get into properties that are way more than they need or can afford should something happen to a spouse or themselves. Besides, who wants to be house poor? Yeah, I just said that. For all the talk about budgets and how important they are – most of us don’t even follow them. Now, I’m not against writing down your expenses and income to see where you are at and what you can improve on – but most of the people I know who are really good with their money DON’T do budgets. Instead, automate your finances and go on with your life. Charlie and his wife have instituted a no-budget, two-checking account system that has worked wonders for their finances. Try it yourself. It’ll be one less thing to worry about. The government isn’t here to provide better lives for us. I’m done waiting for the government to bail me out. We have to be our own / and each others keepers. While it took me longer than it should have – I’m putting money into retirement, building passive income streams and doing side gigs in the hopes of a better tomorrow. This helps alleviate unproductive worry about the future. One of the most helpful things I do is to give it all over to God. If He truly is the Creator of the universe, and cares for His creation – what have we got to worry about? This is an important concept for me to keep bringing to mind and gives me great peace. 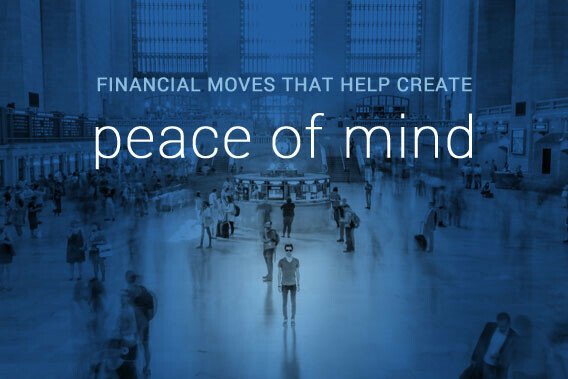 I’d love to know how you are creating more peace of mind within your finances? How Long Should You Keep a Car? After I read your column, I thought of the peace that a Health Savings Account brings me. The HSA is for funds that can only be used for health-related expenses. I have a rather big medical expense coming up, and, knowing that these funds are set aside and not coming from my other savings has made it less stressful to me. Maybe I should set up other savings accounts for specific purposes. This is a great idea Dave! I wholeheartedly agree with all of the suggestions you made, Aaron. I would also suggest renters insurance for people who rent and a home warranty for people who own their home, especially if it is a house with older appliances. I recently lost my job and the fact that I’ve lived below my means for a few years now made the transition a lot easier. It’s a little less scary and there’s a little less pressure, knowing I can get by for longer since my expenses have always been very low. Hey Heather – sorry to hear about your job loss. I’m sure it a relief knowing you have lived within your means and have reserves. Hope you land something soon!